5ft Antique E.J Riley of Accrington Snooker Dining Table with Cabriole legs in solid English Oak. The picture above taken in the workshop before delivery of the last table of this model we refurbished. One piece Welsh slate bed. 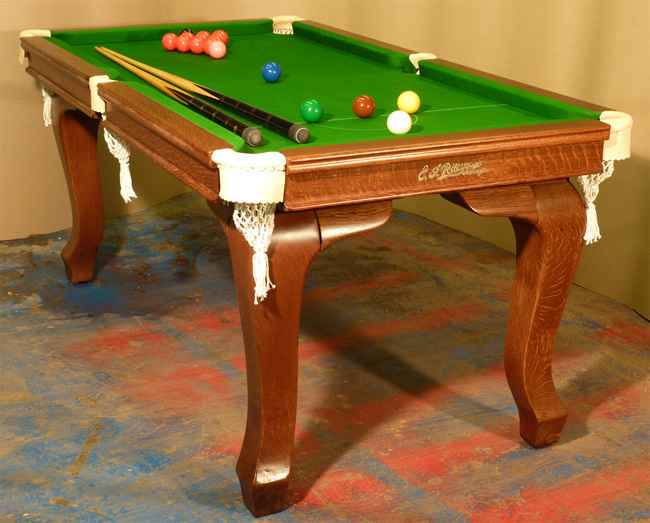 Comes supplied with cue rest, 2 snooker cues, scoreboard and a set of 1" 7/8" snooker balls. 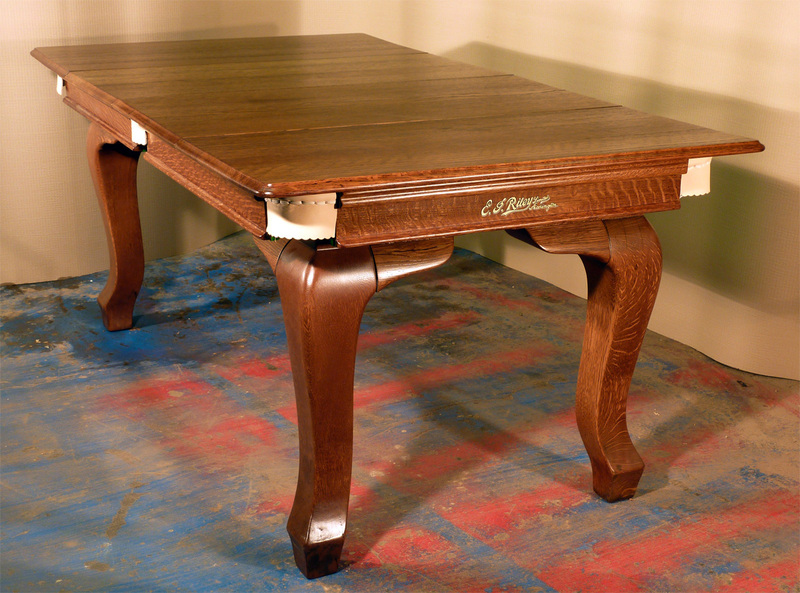 Solid Brass rise and fall mechanism to take the table from dining height to playing height. 4 Piece solid oak table top. New Pockets, leathers and Nets. Outside dimensions are 66"inches x 36"inches. Inside playing area 56.5"inches x 26.5"inches. Playing height 32.5"inches dining height 29.5"inches. Dining table top 68" x 38". Manufactured in Accrington England circa 1930's. Precision Ground 1 piece 1/2" Welsh Slate bed. Manufactured and Refurbished In Accrington England. If your room is under development, we understand that building works seldom go to plan and will hold the table until you are ready to take delivery. We are not a high volume manufacturer with most of our tables made or refurbished to our customers special instructions. ( we do things the old way ) To place an order a 20% deposit is required either by cheque or bank transfer. Work will start as soon as the deposit funds clear. The balance paid in cash or bank transfer at point of installation and your satisfaction. Please see our "Customer testimonials page for reassurance". Lead time 5 - 6 weeks. All our tables are fully refurbished in our Accrington snooker factory, Lancashire by ex E.J Riley employees.